Glenn T. Braden, founder of Oklahoma Natural Gas Company and one of the first proponents of using Oklahoma’s wealth of methane gas for fuel, bought the land that later became the White City neighborhood from the Creek Indians in 1912. Early histories of Tulsa indicate that Braden, a Pennsylvania native, brought a herd of Jersey dairy cattle to this area during World War I. He established the White City Jersey Dairy Farm four miles outside the city limits. It was so named because of the color of the buildings and silos Braden built there. After his death, Braden’s children closed the dairy, platted the land and began selling lots to employees of the nearby steel and oil field supply companies. The W.D. McCoy “organization” was put in “…active charge of developing White City and the sale of its acreage tracts.” Targeted at Tulsa’s middle class, the addition offered “…something new and inviting — modern suburban acreage.” The addition was platted into large acre tracts of various sizes. Many of the streets were graded, rolled and oiled or chatted. City land records show 1946 to be the high-water mark in White City land sales. The open fields began to fill with homes. One of the important amenities included within the original White City Addition was a park area for the neighborhood. Located towards the southern end of the development, the park was originally called “White City Park.” However, within a few years of the neighborhood’s opening, the name changed to “Braden Park,” under which the park continues to operate. A popular attraction in the park during the 1930s through the late 1940s was a wading pool. The city of Tulsa closed all wading pools in the city in the late 1940s due to a polio scare. Although the facilities in the park have changed over the years, the park continues to be a focus of the neighborhood. The district is dominated by two related architectural styles. The two styles correspond to the two main periods of the neighborhood’s development. 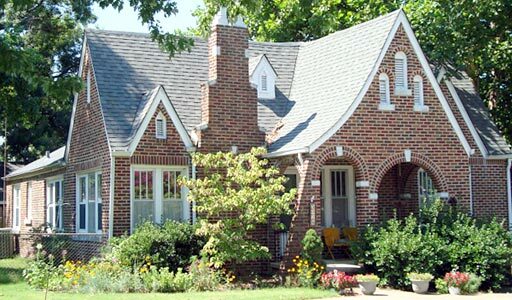 During the district’s first period of development, from about 1926 to 1930, Tudor Revival style houses dominated. Of the 480 buildings in the district, 149 are classified as Tudor Revival. Generally constructed of brick, these houses have a steep pitched roof with a facade dominated by one or more prominent cross gables. This style of houses, loosely derived from historical antecedents, was popular nationally from about 1890 to 1940. The second dominate architectural style within the White City Historic District is the Minimal Traditional style which is related to the Tudor Revival style. The Minimal Traditional style has been called “…a simplified form loosely based on the previously dominant Tudor Revival style of the 1920s and 1930s.” Also frequently constructed of brick, Minimal Traditional houses are characterized by a dominant front gable, low or intermediate pitched roof and minimum decorative detailing. Further, although detached garages were constructed in conjunction with this style of home, many examples have attached garages. This Modern style of houses was popular nationally from about 1935 to the present. White City was placed on the National Register of Historic Places on June 14, 2001 under National Register criteria A and C. Its NRIS number is 01000663.